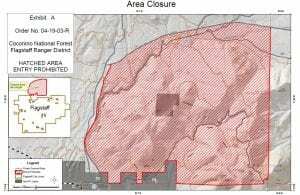 Coconino National Forest has issued a closure order for an area of the Flagstaff Watershed Protection Project that includes Dry Lake Hills and a large portion of Mount Elden in order to keep the public safe from forest harvesting operations. 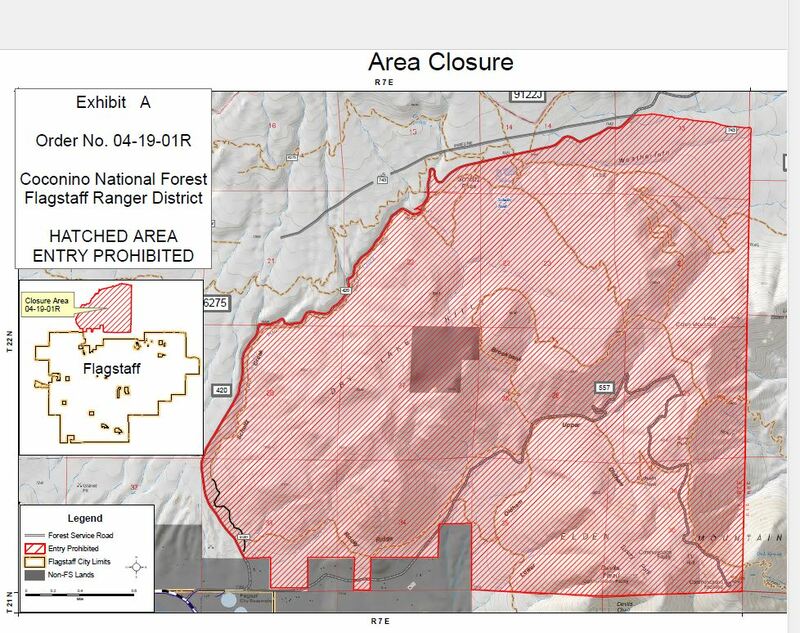 The public is restricted from entering this closure area so that helicopter logging and forest thinning operations can be conducted safely. Heavy equipment and truck traffic will be present on Schultz Pass Road (Forest Road 420), Elden Lookout Road, and U.S. Highway 180. 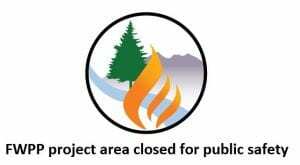 Several miles of Schultz Pass Road with the closure area are closed, as well as Elden Lookout Road, for public safety. Harvesting operations are expected to conclude sometime this summer. Violation of these prohibitions is punishable by a fine of not more than $5,000 for individuals and $10,000 for organizations and/or imprisonment for not more than six months. 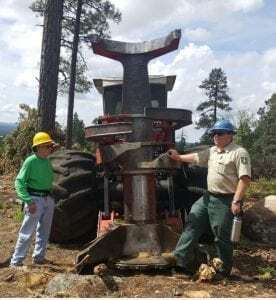 On Thursday Aug 23rd, USFS Volunteer and FWPP partner Karen Malis-Clark lead a field visit through both the recently completed portions of the hand-thinning and mechanical harvesting areas at the base of Mt Elden. 40 engaged community members showed up to walk through the site, including several participants from a neighborhood immediately adjacent to the project area. Discussion at the interpretive stops included: safety briefing, background of project,equipment and current operations, future rehab work and timeline, slash/prescribed burning, partnerships involved, understory and wildlife response, and community support. There was extended time for Q&A and deep discussion, with many expressing their “thanks” for providing this field opportunity for this important project. Thank you to our community for coming out to learn more about FWPP and thank you for bringing all the great questions and perspectives. Thank you Karen for being a great field visit leader! FWPP in an article by the AZ Republic! 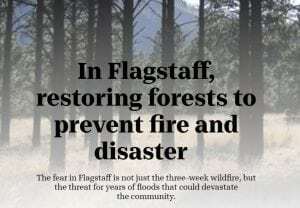 The Flagstaff Watershed Protection Project (FWPP) along with other forest thinning efforts are highlighted in this recent report by the AZ Republic. In addition to FWPP, the article examines other ongoing forest thinning and fire risk reduction efforts in Northern Arizona. Additionally, the article addresses some of the honest truths about the work FWPP and others are doing. Moving forest thinning forward in challenging terrain and across a large scale is expensive and full of challenges. FWPP would not be possible without the hard work of so many other organizations and dedicated people trying their best, despite the challenges, to move our forests in the right direction. Please take 15 minutes to read about it! 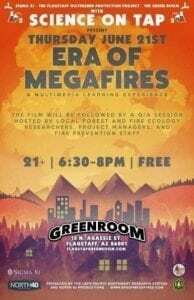 Please join us on June 21st, from 6:30 – 8:00pm at the Green Room in downtown Flagstaff for a screening of the film “Era of Mega Fires”. This film, collaboratively produced by the US Forest Service and North40 Production, discusses the growing trend in large, high severity wildfire across the Western United States. The film traces the past forest management practices over the last 100 years that have led to the current problem, an “epidemic of trees”. The film discusses several ways local communities can take action to increase the health of the forest, and protect their communities from damaging wildfire. 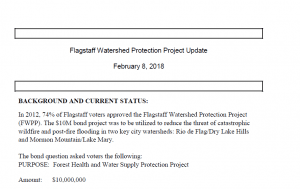 The Flagstaff Watershed Protection Project is featured as a case study in this article published by the Forest Service Employees for Environmental Ethics (FSEEE). The article retraces the history of FWPP and the current status of FWPP implementation. The article also highlights similar projects occuring in Ashland, Oregon and Santa Fe, New Mexico. The article identifies the common successes and challenges of this type of work across the West. 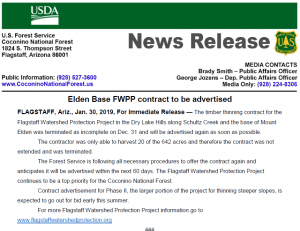 On March 31st, 2018 the US Forest Service reoffered the FWPP Phase 1 (Elden Base) Timber Sale Contract. This 642-acre area is at the base of Mt Elden: it was previously sold but ended with little work completed this past December. 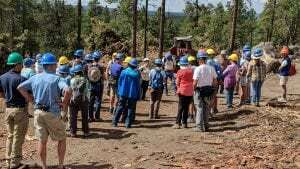 The Coconino National Forest will open bids on May 1st, 2018. The sale period is for up to one year. 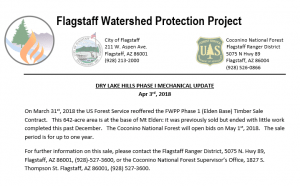 For further information on this sale, please contact the Flagstaff Ranger District, 5075 N. Hwy 89, Flagstaff, AZ 86001, (928)-527-3600, or the Coconino National Forest Supervisor’s Office, 1827 S. Thompson St. Flagstaff, AZ 86001, (928) 527-3600. 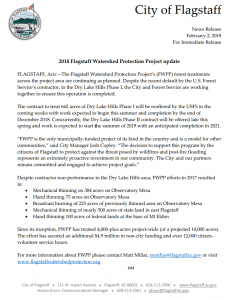 City and FWPP project leadership have produced and released a project update on the Flagstaff Watershed Protection Project. The update highlights the work we have done since the start of the project five years ago. Updates includes how much work has occurred and where, how much of the voter approved bond has been used to support the ongoing project, and how much outside, leverage funding has been brought into the project with the help of all our partners. The project has come a long way since the beginning, and the City team is still working hard as the project continues to be implemented. Take a look at the report! The FWPP project area along Schultz Creek and around the base of Mt Elden will be advertised in the near future. Stay tuned for more details.